Having read these docs, im still somewhat confused on generating 3d static object lod when using tree replacer mods like realistic aspen trees, etc. I have quite a few questions, but we can start with this. In the base resources for sse dyndolod, there is included several treeaspenXpassthru_lod.nif that i assume will be used when you generate 3d SO lod for these trees. But, realistic aspen trees mod is just a replacer, so how will dyndolod know it should use treeaspenX_XXXXXXXXpassthru_lod.nif in \Meshes\DynDOLOD\lod\trees\rat\ instead of default ones? See DynDOLOD\Docs\trees.ultra\tools\DynDOLOD_CreateStaticTree.html for explanation of the CRC32 checksum which is used to match trees to tree LOD resources. Youre saying that the 8E204123 checksum corresponds to the full mesh that was used to generate the 3D static mesh? If so, how does it know to look in Meshes\DynDOLOD\lod\trees\custom-mod-1\ instead of Meshes\DynDOLOD\lod\trees\custom-mod-2\ or any other directory? For the realistic aspen trees 3d statics that are included with dyndolod se, they are all found in \rat\ directory. If i create my own 3d statics, should i just make a separate folder and call it whatever i want, or does it matter? Also, the documentation says "Start xEdit.exe, unfold TREEs, mark trees you want to work on and then apply script DynDOLOD_CRC32Gen.pas". Is this still valid or has this changed since dyndolod now runs its own executable? 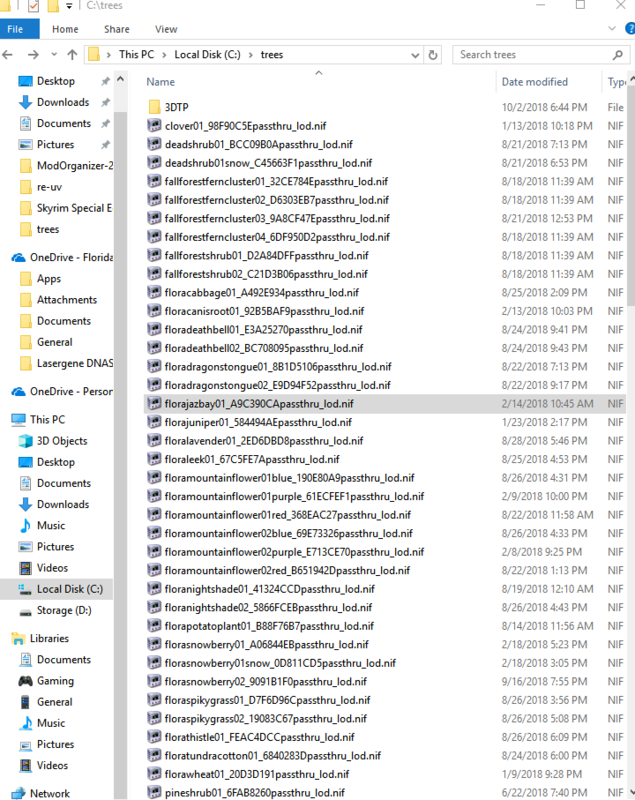 As I keep mentioning every chance I get, different folders do not matter, only different filenames. See DynDOLOD_Mod_Authors.html "How to add your own LOD models" which explains the scanning of subfolders in meshes in general for different LOD objects. So for 3D tree LOD, it tries to find LOD files with part of the full mesh file name + the full CRC32 in any subfolder of "meshes" unless the folder path matches the IgnoreLODMesh= list defined in the DynDOLOD. You can create any folder structure that makes sense to you as long as it is in meshes and not accidentally matches the IgnoreLODMesh list. The instructions how to run the DynDOLOD_CRC32Gen.pas should still be valid. Edited by sheson, 03 October 2018 - 03:22 AM. Don't worry about it. The docs are a bit scattered here and there, since they are grown over the years. Edited by sheson, 06 October 2018 - 01:28 AM. i thought i had tried that but i guess not; that worked. However, i thought this was supposed to generate a nif file with animations etc removed. For me it is creating 3 *.bto files. One of them is ~130 KB and the other two are only 1KB in size. If i change the large one to .nif file, it opens in nifskope just fine. But im not sure if this is what I should do, or if there is a way to input NIF and output NIF. The output files are merged.16.0.0, merged.8.0.0, merged.4.0.0 - it is the 4.0.0 level file that i can open in nifskope by changing extension. I case the GameMode does not exist it will default to creating static object LOD for TES5. You either want to use Merge5 or Convert5 or maybe try ConvertSSE. Each mesh you want to convert needs a line in the file. Using the windows command prompt with the command "dir /B > file.txt " you can "export" all filenames in a folder into a text file. Then edit the text file to add the other required data. Edited by sheson, 07 October 2018 - 04:18 AM. yeah im familiar with how to output dir to txt file. so i will try those other modes you listed. then i can make a merge.txt that looks like this and it should process all files? EDIT: funny thing is, i just ran it against all 118 meshes that I am converting, and it worked, but the resultant meshes are larger file size than the original meshes. Sounds like the input are NIF in Skyrim SE format, while the output is now in Skyrim format. Try ConvertSSE. For NIFs that are used to build object LOD meshes the format does not really matter. Could not re-UV meshes\dyndolod\lod\trees\3dtp\treepineforestsnow05_026d7a95passthru_lod.nif treepineforestsnow01 The given key was not present in the dictionary. is there any way to address this? "Untile" the textures manually so that the UV is >= 0 and <= 1. It is probably the trunk. If you upload treepineforestsnow05_026d7a95passthru_lod.nif I can have a look. Edited by sheson, 22 October 2018 - 02:45 AM. "C:\Gaming\Elder Scrolls\SkyrimSE\Mod Organizer\mods\DynDOLOD - Main\Meshes\DynDOLOD\lod\trees\SFO\treepineforestsnow05_026D7A95passthru_lod.nif"
"C:\Gaming\Elder Scrolls\SkyrimSE\Mod Organizer\mods\DynDOLOD - Main\Meshes\DynDOLOD\lod\trees\3DTP\treepineforestsnow05_026D7A95passthru_lod.nif"
The CRC32 is created from the full model that is installed at the time. Make sure the correct mod and assets are enabled. Collisions are possible of course. If you are positive that two different full models created the same CRC32 upload them. Here is an updated version of LODGen.exe/LODGenx64.exe to replace in the Edit Scripts folder. If will now properly re-UV the trunk with the name treepineforestsnow01 in 3DTP treepineforestsnow05_026D7A95passthru_lod without the error message. Re-UV happens because the UV of the trunk is outside of 0 and 1 and it needs to be converted in order to use the atlassed texture. However, without providing a proper LOD texture you may not really want to let it do it that, as that will increase the triangle count considerably. Your options are to edit the shape name (currently treepineforestsnow01) and add NoReUV to it, so LODGen will skip that step entirely. The case of NoReUV doesn't matter, can be in front or after the existing name, with or without space. You can easily edit the name of a shape with nifskope. If there lots of these trees in an area, there is no huge advantage to use a texture on the atlas (saves draw calls) instead of one large shape (combined from lots of trees) using a single texture. Typically object LOD uses the single mountainslab texture too for example, because all rocks and mountains use it everywhere anyways. So it is either less triangles / more draw calls or more triangles / less draw calls. In order to have a good re-UV without increasing triangles count too much, you can use TexGen to automatically create a LOD texture for the trunk whenever the plugin for the tree mod is in the load order. DynDOLOD_Mod_Authors.html explains how to add rules for TexGen for a mod and place it in the games Data/DynDOLOD folder so it can be shipped with the mod. Since I was testing things already you can download this as an example. If you open the file in notepad you can see some commented (//) rules for 2x1 and 2x2 versions as well the active one for 2x4. Which means the LOD textures uses a "mini atlas" of the full model textures tiled 2 times in U and 4 times in V. Obviously there should be only one "active" rule for each input/output texture. Once TexGen created the LOD texture, DynDOLOD and the LODGen will pick this up and the result of the automatic re-UV will be much better, since less new triangles have to be created to keep the UV within 0 and 1 - since it basically means UV now can be between 0 to 2 for U and 0 to 4 for V while using the object LOD atlas texture, resulting in less draw calls. Without further reduction in triangle count there is no much difference over simply using the full model back. I recommend to further optimize the NIFs by replacing the trunks with billboards if possible (the SFO version for example) and/or trying to decimate 3D models with 3DSMax/Blender or other tools. For "complicated" flora/fauna using Simplygon to create "imposters" seems the way to go though.